I’m sitting here listening to a yellow jacket determined to commit suicide in one of my wall lamps, and wondering why Amazon seems so hell-bent on annoying its authors these days. This weekend, August 5-6, Patty Jansen is hosting another big 99c promo with 100 books in various science fiction and fantasy genres. I entered my boxed set of Looking Through Lace, Books 1 & 2, and was accepted. Only now it looks like my book won’t be on sale — at least not on Amazon. And it’s anyone’s guess if I will have to take the book down or not entirely (on Amazon), for reasons no one has seen fit to provide me answers with. But let us start at the beginning, shall we? If you publish books for which you do not hold the publishing rights, your account may be terminated. I wrote back, asking why they were requiring confirmation of publishing rights for a book that had been published with them for over a year and a half. 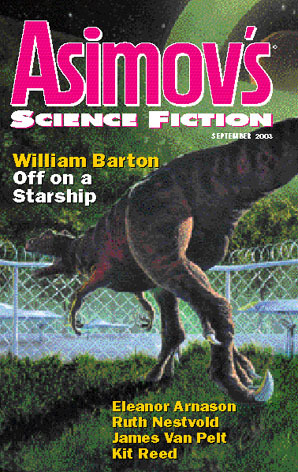 I listed some of the publishing credits of Looking Through Lace and explained why I still had the rights to my own novella, which was originally published in Asimov’s in September 2003. Please provide any documentation or other evidence that proves you have retained rights for the book(s) listed above. This, of course made me even more frantic. 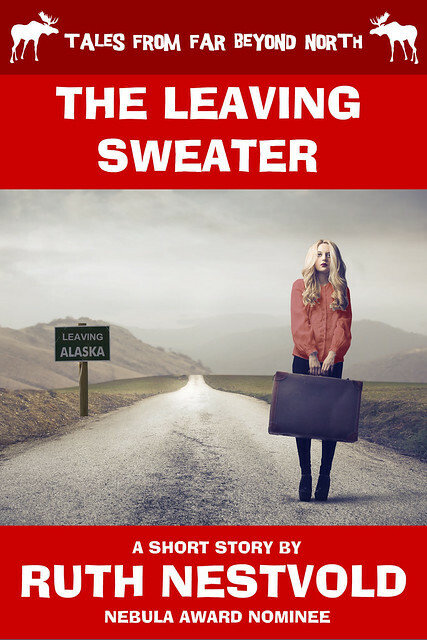 I could hardly imagine that anyone was trying to steal my novella, since it wasn’t exactly selling like gangbusters. Most of the time it just sits there, selling a few copies a month, except when I do some kind of promo. But why would Amazon keep insisting I prove my rights to my own work if someone hadn’t tried to steal it? And why wouldn’t they respond to my questions and tell me what was the specific problem so that we could clear things up? None of what they required as “acceptable documentation” applied to Looking Through Lace or the boxed set. Every time I tried to write them to try and find out what was going on, I got one of the above canned responses, about a half-a-dozen in all — and me becoming increasingly aggravated. Finally it occurred to me (no help on Amazon’s part) that this weirdness regarding Looking Through Lace might have to do with the fact that it was recently reprinted in a new anthology, Galactic Empires. I sent them the PDF of the contract with Neil Clarke, and pointed out the clause indicating non-exclusive rights. They haven’t sent me any more stupid canned emails since. But they also still have not gotten around to lowering the price of the boxed set for the promotion. I used to be a huge proponent of Amazon, but since the page flip controversy, I’ve changed my ways — more and more with each passing conflict. “Starting Out as an Indie Author” made “hot new release”! And I did no advertising to get there — it was all mailing list and friends sharing the news. So a huge thanks to all of you! 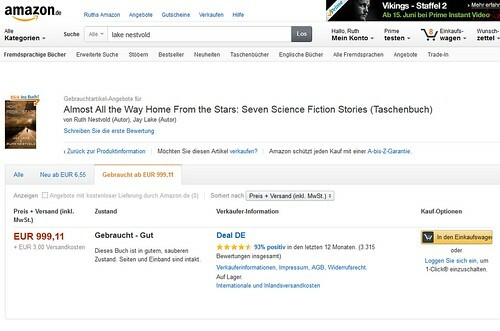 Amazing deal on Amazon.de: Get Almost All the Way Home From the Stars for under 1000 Euros! I wonder what bots were at work this time to come up with such an incredible opportunity. “Dragon Time” live as Countdown Deal, and “Gawain and Ragnell” finally free! 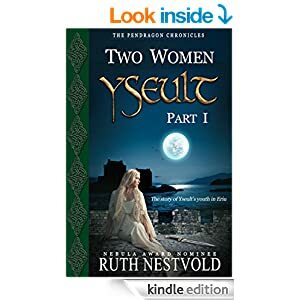 I published my first ebook, Yseult, in January 2012, pretty much simultaneous with the introduction of KDP Select. I opted in and set my first promotion for a mere week after publication — and I didn’t have a clue how lucky I was. I got a couple of quick reviews as a result of review copies I’d given away, and my brand new little baby (or rather big fat hunking baby — the hard copy book comes in at over 600 pages) got picked up by no less than Pixel of Ink, which at the time was *the* way to ensure that a freebie promotion would be successful. Back then, using free days with KDP Select was an excellent way for a new indie writer to gain exposure and (after the free run) sell books. That first month as an indie publisher, I sold 242 books. I added more titles, mostly collections of my previously published short stories, and by spacing regular free runs across all my titles, I could increase my visibility as a whole and ensure that I continued to sell books. But then Amazon made a couple of “corrections” to how free downloads were counted towards popularity and sales rankings (the infamous “Amazon algorithms”), and they hid the top 100 free book listings on pages that didn’t as easily show up when browsing. Free days became less and less effective as a marketing tool, to the point where it now is basically useless, unless you have a simultaneous ad running on Bookbub (which is very pricey). Nowadays, you have to pay to give books away. – Your royalty rate remains the same even while the book is on sale. So instead of getting only 35% on a book marked down to 99c, you get 70%. The income is still naturally quite a bit less, but if it results in increased exposure, it’s worth it. And it certainly beats giving your book away. – Amazon has set up a dedicated “Kindle Countdown Deals” page at www.amazon.com/kindlecountdowndeals – but of course there is no guarantee your Countdown Deal will get listed. On the dashboard, you click on “Manage Benefits” and then just fill in the details for your sale. I decided to go with a seven day, single price 99c sale of my short story collection Dragon Time to test the waters, starting tomorrow Nov. 4 and going to Nov. 10. You can also have a sale where the price gradually returns to normal. For example, for my Dragon Time sale, I could have increased the price halfway through the sale to 1.99 if I had wanted to. It will be interesting to see what good this does, if any. I’m suspecting the exposure won’t be enough to make KDP Select attractive enough to return to, at least not for most of us. But we’ll see — starting tomorrow. I will naturally report my results when the promotion is over. As many writers have noticed by now, this month Amazon has been playing merry with its browse categories, deleting a couple, and adding a whole lot more. In the long run, this might well be good for writers, giving us more chances for exposure, but what a lot of us saw was an immediate and dramatic decline in sales. I think this mostly applies to those who had books in categories that were deleted, or whose books were reassigned to new categories, not necessarily the best or most appropriate. For example, at least one of my novels was being listed for a while under the category nonfiction/history! If this kind of mix-up has happened to you, you might want to try changing your categories. The new categories that Amazon assigned to books seem to be based on the keywords you enter when you publish on KDP. India Drummond has already written an excellent article about how to get your categories reassigned by changing your keywords, which you can read here. Another possibility is to contact Amazon directly with the information on which new categories you would like your book to be listed in. I have a longer post about doing this here, but if all you want is the direct link, that’s here. Needless to say, I did not request to have Yseult changed to “First Contact” — that was for Looking Through Lace. But I sent the requests on the same day, and Amazon support lumped them all together under one author, and I ended up with two epic historical fantasies listed in SF categories. Sigh. So if, like me, you write in multiple genres or even sub-genres, don’t try try to change too many books in different categories in one day by contacting KDP directly. That is apparently too taxing for the Amazon support folks.